Global organizations are invited to take part in this year’s LEO and Watershed survey on measuring the business impact of learning, which aims to benchmark L&D thinking on measurement. We would be very grateful if organisations could take a few short minutes to answer the questions. We will then be able to give back to the industry a sense of the trend in the pressure from leadership to measure the business impact of learning. 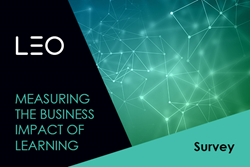 Organisations across all industries are being given the chance to help identify patterns and inform the latest L&D thinking by taking part in the second year of LEO and Watershed’s cross-sector survey on measuring the business impact of learning. Last year’s survey, carried out by LEO alongside Watershed, drew responses from over 350 companies across Europe and the US, from government and motoring to aviation, defence and technology. While the responses uncovered a number of key talking points, including a desire to use analytics and data more effectively, this year’s survey will have the added benefit of being able to benchmark year-on-year data. Companies have a limited amount of time to take part, with the survey open for submissions from now until the 22nd of November. LEO’s Chief Strategy Officer Piers Lea, who guided the original survey report, said: “We would be very grateful if organisations could take a few short minutes to answer the questions. We will then be able to give back to the industry a sense of the trend in the pressure from leadership to measure the business impact of learning. Mike Rustici, founder and CEO of Watershed, said: "Last year's L&D benchmark survey gave insight into the challenges organisations face in measuring impact, and surfaced a surprising commonality among many L&D leaders: too many competing priorities. "This year's survey is aimed at discovering what has changed, what's stayed the same, and whether we're heading in the right direction as an industry. We'll also be sharing live results so participants can follow along as survey responses are submitted." Organisations who take part in the research will receive real-time results and the full report will be made available on leolearning.com in early January. For more on measuring the business impact of learning, read LEO’s insight, ‘The growing appetite for measuring the impact of learning at work’, or get in touch on measuring(at)leolearning.com. Watershed helps corporate training and learning departments better align their initiatives with business goals. Our comprehensive learning analytics technology measures training effectiveness, performance improvement, and business impact to help maximize investments in learning. Made possible by xAPI, Watershed enables users to explore all their learning and performance data in one place and measure how L&D is impacting their organisations. Watershed has experience working with clients such as Visa, Google, Yum! Brands, and Bridgestone, just to name a few.